You can use the calculator for flow rate and pressure drop calculation in a constant diameter, natural gas pipeline. The calculator assumes that the flow is compressible. 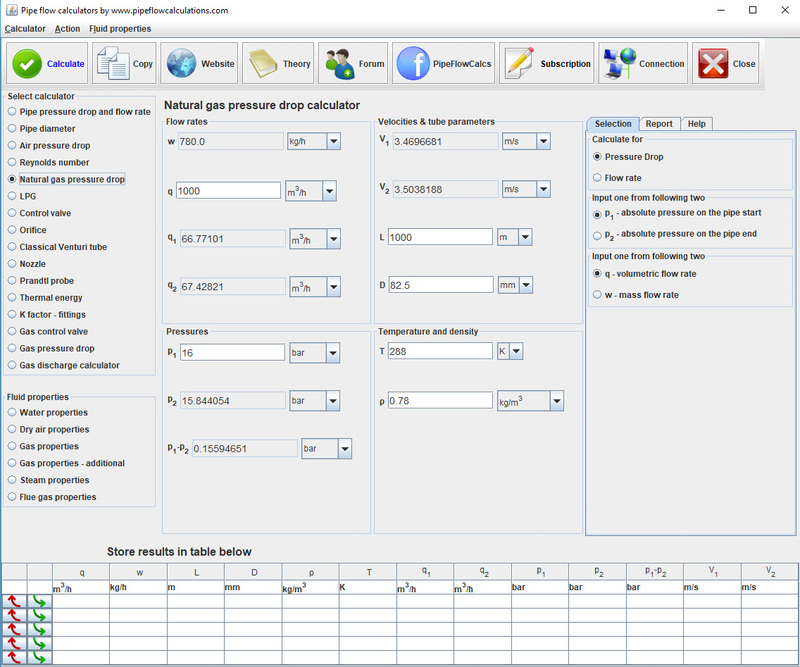 Therefore you can use the calculator for pressure drop and flow rate in medium to high-pressure gas lines. Gauge pressure must be higher than 1 bar and lower than 100 bar. The pipeline should be longer than 1m. The Calculator uses Renouard equation for calculation. It assumes that the temperature of the natural gas flow in long pipelines is constant. The temperature of the natural gas in gas lines is constant because natural gas recovers the drop in temperature through the heat exchange with the surrounding soil. In the flow rate calculation scenario, the calculator calculates and shows the flow rate at standard conditions. If you are calculating pressure drop, then you should enter flow rate at standard conditions in the calculator. - t = 15 0C. The calculator also presents actual flow mean velocity in the pipeline for specified pipe diameter. This calculator is not suitable for low-pressure gas installations. The calculator can't be used to calculate pressure losses due to resistance in valves and pipe fittings and pressure changes due to height change.